Yamaha Cygnus Alpha now available with a front disc-brake at Rs 52,558. Yamaha has launched a new disc-brake equipped version of the Cygnus Alpha scooter in India. 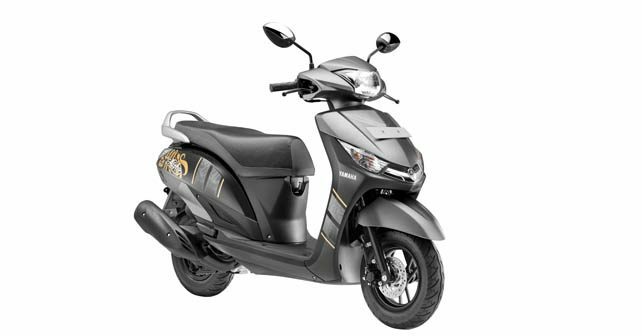 Priced at Rs 52,556 (ex-showroom, Delhi), the new scooter will be available at Yamaha dealerships across India in a couple of days. No mechanical updates have been carried out in the scooter apart from the addition of a front disc brake. It comes powered by the same 113cc single-cylinder engine as before, developing 7bhp of max power and 8.1Nm of torque. Power is transmitted via a CVT gearbox in an effortless manner. The scooter has an ARAI certified fuel efficiency of 66km/l. Since it’s a new variant, Yamaha has tried to jazz it up a bit by adding new ‘calligraphy’ graphics and two new exterior shades on the scooter, namely, Radiant Cyan and Marvel Black. Other than that the scooter remains largely unchanged from the standard model. Yamaha offers three more automatic scooters in the market – Fascino, Ray Z and Ray ZR. The Cygnus Alpha can also be had with drum brakes in standard trim. However, given the benefits, it only makes sense to invest a wee-bit more in the disc-brake version. Also, it’s good to see that other scooter manufacturers in India including Honda, Suzuki and TVS are now offering disc brake as an optional extra on their respective products as well.